Shopping for outdoor apparel (no matter how outdoorsy you consider yourself) can be pretty overwhelming. How much warmth do I really need? Does breathable mean drafty? How much sweat can this thing really wick? To help out their fellow outdoor enthusiasts, The North Face recruited the smarts of none other than IBM's Watson. 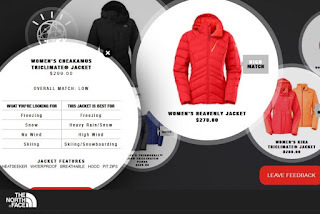 Through an interactive, dialogue-based online shopping experience, Watson will help users to pick the exact apparel they need for their exact activities. The recommendations get smarter and smarter with each use, and although still in Beta, responses have been incredibly positive. If successful, the possibilities for this to enhance all e-com experiences are endless and SUPER exciting!